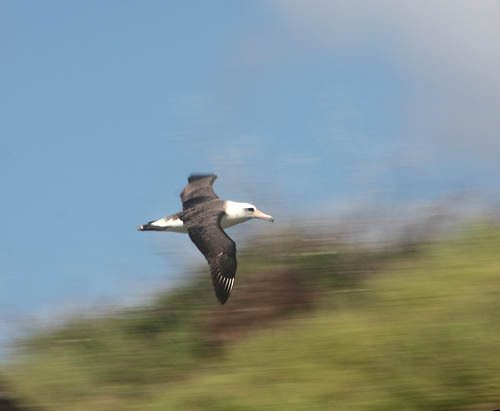 The winter months are a great time to hike to Kaena Point to see the migratory and year-round animals that live at the western-most tip of Oahu during Makahiki Season. Starting from Keawaula Beach (Yokohama Bay), I made my way along the rocky Waianae Coast to Kaena Point, climbed up and contoured around the badly eroded section of the road, and dropped-down into the Natural Area Reserve which is managed by the State of Hawaii’s Division of Forestry and Wildlife. 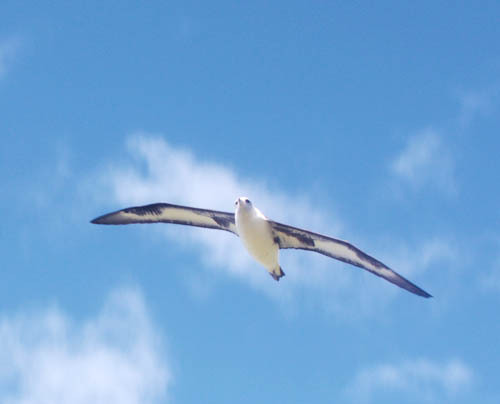 Curious Moli or Laysan Albatrosses (Phoebastria immutabilis) greeted me as I entered the reserve. 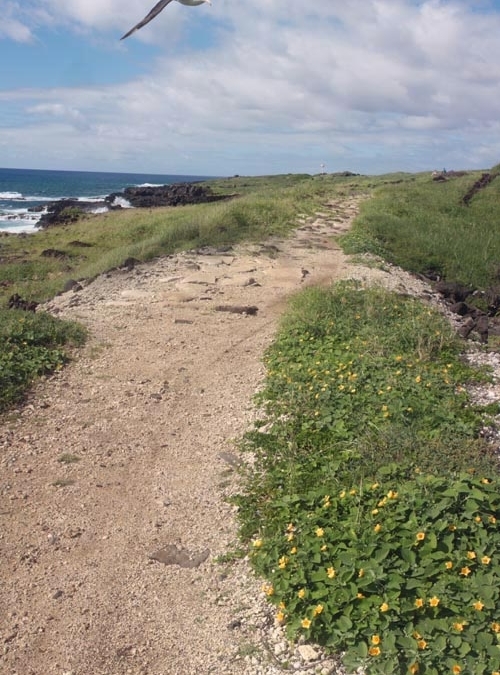 Due to heavy Kona winters storms over the past 2 months, ilima flowers were in bloom along the side of the trail. Moli arrive during Makahiki, a four-month season in old Hawaii that began with the first sighting of makali’i (the constellation Pleiades) on the horizon in late October or early November. As the year’s harvest was gathered, tribute in the form of goods and produce were offered to the chiefs. War was prohibited and Makahiki was a time of feasting, athletic competition, and hula. Moli are large sea birds with 6-foot wingspans that are indigenous to the North Pacific. They are strong fliers and can spend their entire lives over the ocean feeding and sleeping in the air without ever landing on solid earth. They do however, need to return to the land to nest and raise their young. Each year several hundred thousand pairs of Moli — also known as White Gooney Birds — migrate to nesting sites on Midway, Laysan, and other atolls in the Northwest Hawaiian Islands. Smaller numbers nest at Kilauea Point on Kauai, on Lehua Island offshore from Niihau and at Kaena Point on Oahu. 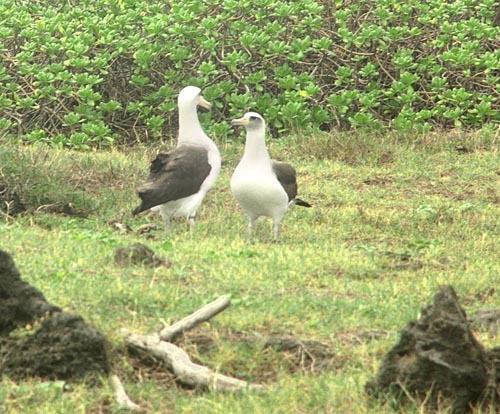 At Kaena Point, only several dozen pairs of Moli appear now days, a mere fraction of their former numbers in historic times. 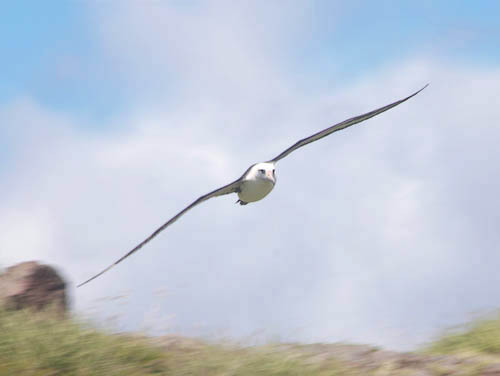 Laysan Albatrosses are remarkably long-lived — they can live for up to 50 years — and form life-long monogamous breeding pairs. Moli undergo an elaborate dance when they are reunited at breeding season. Mated pairs return to the same area (usually within a few yards) where they nested the previous year in order to find each other. The birds mate, nest, and raise fledglings over a 5 month period until their offspring is able to fly and care for itself. Another migratory animal that arrives during Makahiki Season is kohola or humpback whales (Megaptera novaeangliae). 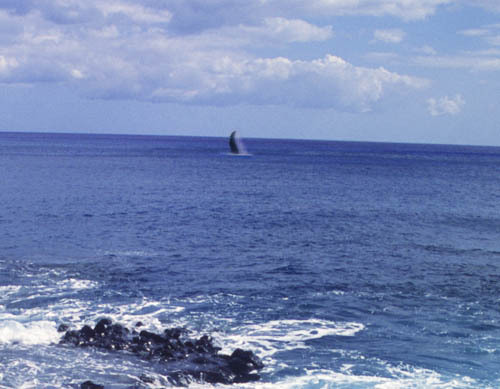 In the photo above, a kohola blows its spout just offshore at Kaena Point. These gigantic sea mammals, which are 40–50 ft in length and weigh about 40 tons, start arriving in Hawaii in November, with their numbers peaking in February and March. This 3,600 mile migration from the Gulf of Alaska takes the whales from 4 to 8 weeks to complete. While I watched the whales at Kaena Point, I saw a kohola slap its pectoral fin against the surface of the water. The majority of the humpbacks that travel to Hawaii end up in the waters between Maui, Moloka’i and Lana’i. Juveniles usually arrive first, followed by the adult males, adult females, and then pregnant females. 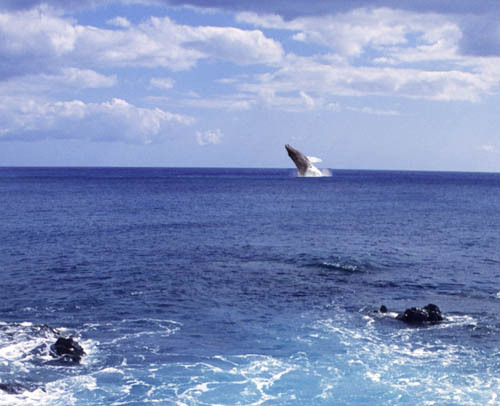 Kohola also like to breach offshore by jumping out of the water and crashing onto the surface of the water. During their 4 month stay in Hawaii, kohola do not feed — they live off layers of blubber accumulated in Arctic waters. Hawaii is for giving birth to offspring, and for courtship and mating for next season’s calves. Whales leave for Artic waters in May to feed on small schooling fish and krill (a small shrimp). An adult humpback can eat over 2,000 pounds of krill in a single day. Other creatures such as this Hawaiian Monk Seal, live at Kaena Point year-round. Over the last 3 years, I have consistently seen a seal — probably the same inidividual — whenever I visit the small cove at the very tip of Kaena Point. 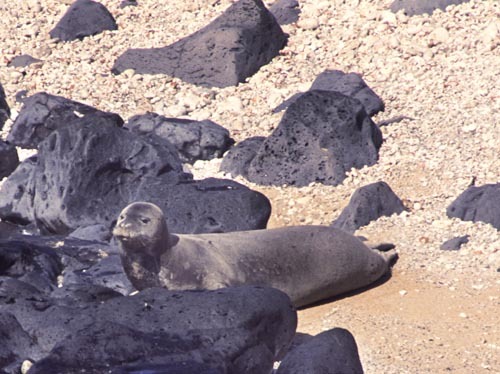 Known as “ilio-holo-i-ka-uaua”, or the “dog that runs in rough waters” in Hawaiian, the seals (Monachus schauinslandi) are endemic to Hawaii and are an endangered species. There are only an estimated 1,200 individuals remaining. 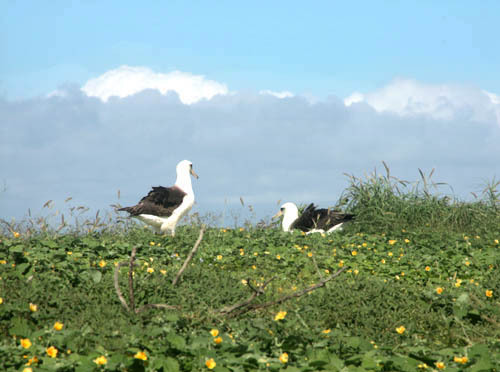 Other year-round residents of Kaena Point include Wedge-tailed Shearwaters or ‘ua’u kani in Hawaiian. ‘Ua‘u kani are indigenous to Hawaii and are strong fliers that hunt far offshore. In Hawai‘i, their diet primarily consists primarily of larval goatfish, flyingfish, squirrelfish, and flying squid. 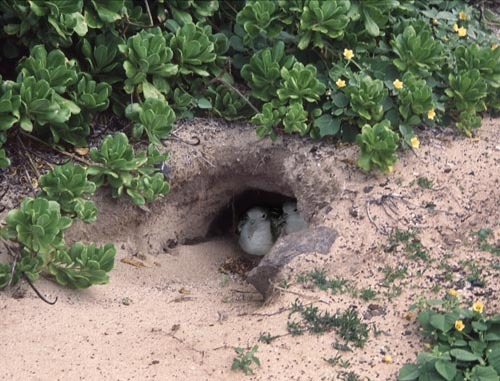 Ua‘u kani dig burrows in the sand to nest and raise their young from June to November. ‘Ua‘u kani form long-term pair bonds and lay only one egg per season. 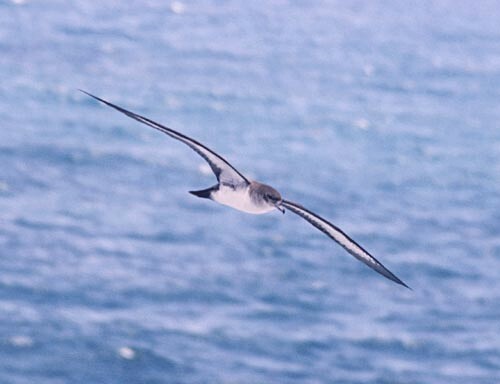 Wedge-tailed Shearwaters often hunt offshore during the daylight hours and return in the evening. They are known for an eery moaning call at night which can be mistaken for the sound of a crying baby. 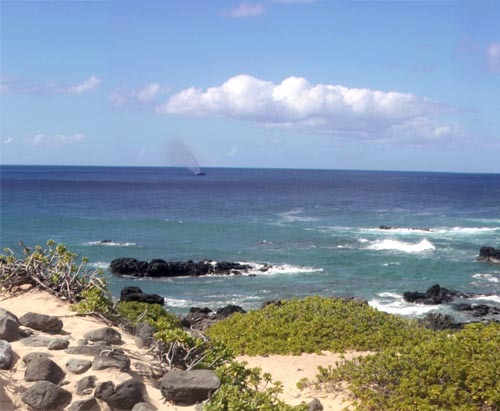 This is the second post in a three-part series about Kaena Point. The first post is here. 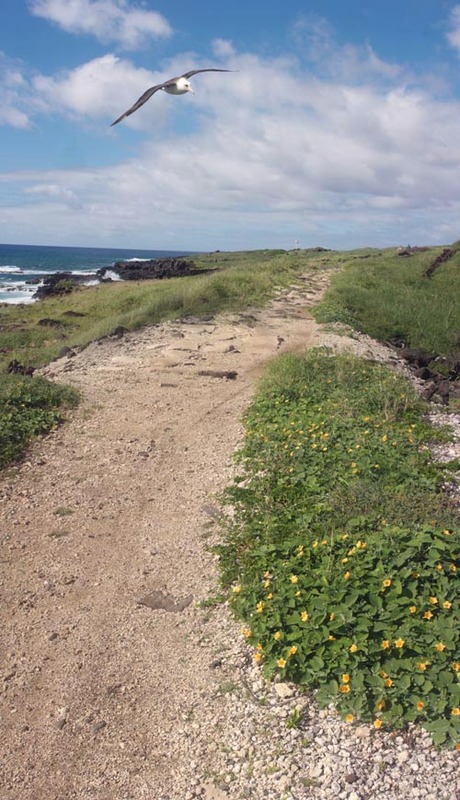 Stay tuned for the next installment on the native plants and pohaku (boulders) at Kaena Point that figure prominently in the stories and culture of old Hawaii. Nathan, you must have animal magnestism. You always seem to get the best shots of the most elusive animals. And all in one trip. Amazing! Heh… pure raw animal magnetism. I actually took these photos on 3 different hikes out to Kaena Point.